A research team led by Dr. Riyi Shi, Purdue Veterinary Medicine professor of neuroscience in the Department of Basic Medical Sciences, has found that a drug developed during World War II as an antidote for a chemical warfare agent is effective at suppressing a neurotoxin that worsens the pain and severity of spinal cord injuries, suggesting a new tool to treat the injuries. The neurotoxin, called acrolein, is produced within the body after nerve cells are damaged, increasing pain and triggering a cascade of biochemical events thought to worsen the injury's severity. Dr. Shi’s team has discovered that the drug dimercaprol removes the acrolein by attacking certain chemical features of the toxin, neutralizing it for safe removal by the body. The findings, detailed in a paper published online in the Journal of Neurochemistry, involved research with cell cultures, laboratory animals and other experiments. Drugs that act as “acrolein scavengers” have been suggested as a new strategy to reduce the neurotoxin concentration. Dimercaprol possesses two thiol groups, which are proficient at binding and neutralizing acrolein, making it especially effective in removing the toxin. The drug, also called 2,3-dimercaptopropanol, was developed by British biochemists during World War II as an antidote for lewisite, an obsolete arsenic-based chemical warfare agent. It is now used primarily to treat poisoning by arsenic, mercury, gold, lead, antimony, and other toxic metals. “To date, the most common acrolein scavengers have been the FDA-approved compounds containing a hydrazine group, such as hydralazine and phenelzine,” Dr. Shi said. “However, these compounds have potential inherent undesirable side effects when used in high concentrations.” Dimercaprol has fewer side effects than other acrolein scavengers. It can be excreted in the urine and does not remain in the system. The research paper was authored by Dr. Shi and biomedical engineering doctoral student Ran Tian. The study was funded by the National Institutes of Health, the Indiana State Department of Health and the Indiana CTSI Collaboration in Biomedical Translational Research Pilot Program. The research dovetails with the goals of the recently formed Purdue Institute for Integrative Neuroscience, which is part of Purdue’s Discovery Park. 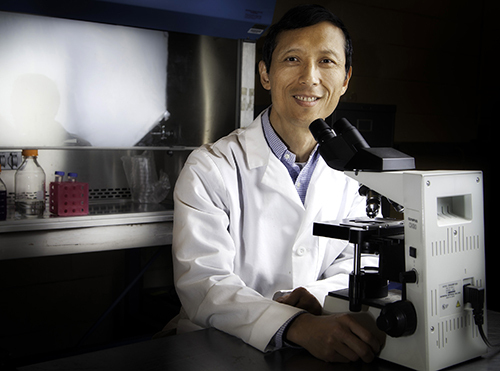 Click here to view a complete Purdue news release about Dr. Shi’s research.